The Class of 2018 has turned its tassels at Burbank and Burroughs highs. Once again both schools graduated a number of fine student athletes, some of which will continue their athletic careers at the collegiate level. The following is a sampling of what to expect in the immediate future for the now graduated Bulldogs and Indians. 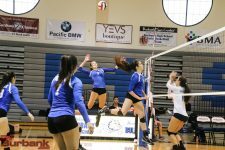 Leading the Bulldogs class is multi-sport star and class salutatorian Melissa Daniel, who will attend Stanford University and play beach volleyball. Class valedictorian Jonathan Ragheb will attend Harvard University and may attempt to walk on the men’s volleyball team. Lauren Ryan will attend Hawaii Pacific University, where she will compete in cheer. Nikki Howell will also compete in cheer, but stay a little closer to home by attending Cal Lutheran in Thousand Oaks. Anna Leonetti will be attending Riverside City College, where she plans to continue in cheer and stunt. Softball player Bene Snyder will continue her career at Trinity University in Texas. Fellow softball player Anysia Gonzalez will continue her career at La Sierra University in Riverside. Bulldog baseball player Abiezer Delgado will continue his career at Hope International University in Fullerton. Burbank will be represented once again by the presence of a number of football players going to the community college route. Moorpark College is getting Drew Pendleton, Kaydon Spens and Andrew Rovira. Anthony Lira will attend Los Angeles Valley College. Christian Fajardo is going to Pasadena City College and Darnell Williams will continue his career at College of the Canyons. Jessie Czarneki will continue her track and cross country career at the University of Antelope Valley. Noemi Apreza and Phoebe Forsyth will both continue their distance running careers at Glendale Community College. Brandon Wilson will continue his water polo career at L.A. Valley College. Lexi Lyneis will continue her water polo career at L.A. Valley College. Rory Rickey will hope to continue his volleyball career as a walk on at UC San Diego. The Indians have several athletes who will play major college athletics, led by senior volleyball player Marin Grote. 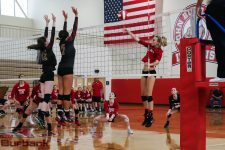 The 6-foot-5 outside hitter will continue her career at the University of Washington. Marin Grote will wear purple in college as a member of the Washington Huskies. Distance running star Jagdeep Chahal, who recently won the CIF Southern Section Division 1 title in the 1,600 meters, will continue his cross country and track career at UC Santa Barbara. Emily Virtue, who was a cross country national finalist as a sophomore, will continue her career on the opposite coast at Columbia University. Pole vaulter Elizabeth Switzer is undecided, as she also has the option of going back to gymnastics, which has her first sport. Also from the girls’ volleyball team, Lauren Zedlar will attend Washington College in Maryland. Sabrina Sullivan will continue her volleyball career at the University of La Verne. Lizzy Jessen will play volleyball at Wellesley College and Ricki Patenaude at College of the Canyons. Mia Staub, the class salutatorian, will play volleyball at Wheaton College in Chicago. Jagdeep Chahal will run for UC Santa Barbara. From the football team, Jacob Real will continue at Glendale Community College. Basketball player Amir Montgomery is undecided but may be leaning toward Glendale Community College, per coach Allan Ellis. Volleyball player Diego Rosal will walk on the men’s volleyball team at Pepperdine, where he will join former Indian Max Chamberlain and coach David Hunt, who grew up in the Glendale-Burbank area. Fellow volleyball player and Pacific League MVP Cole Kaitz will attend Cal State Northridge, but has not decided if he will attempt to walk on or not. Star distance runner Alex Hirsch will attend Harvey Mudd and run for Claremont-Mudd-Scripps. Softball pitcher Presley Miraglia plans to continue her career at Cal State Long Beach. Fellow softball player Jessica Amaya is considering continuing her career Mission College in Sylmar. This entry was posted in Baseball, Boys Basketball, Boys Volleyball, Boys Waterpolo, Cross Country, Football, Girls Volleyball, Girls Waterpolo, Softball, Sports, Track and tagged Abiezer Delgado, Amir Montgomery, Andrew Rovira, Anna Leonetti, Anthony Lira, Anysia Gonzalez, Bene Snyder, Brandon Wilson, Christian Fajardo, Cole Kaitz, Darnell Williams, Diego Rosal, Drew Pendleton, Elizabeth Switzer, Emily Virtue, Jacob Real, Jagdeep Chahal, Jessica Amaya, Jessie Czarneki, Jonathan Ragheb, Kaydon Spens, Lauren Ryan, Lauren Zedlar, Lexi Lyneis, Lizzy Jessen, Marin Grote, Melissa Daniel, Mia Staub, Nikki Howell, Noemi Apreza, Phoebe Forsyth, Presley Miraglia, Ricki Patenaude, Rory Rickey, Sabrina Sullivan on May 25, 2018 by Jim Riggio.